Today’s consumers and enterprises demand the smartest, most-efficient, highest-performance electronics to enable efficiencies and strategic advantages within some of the fastest growing markets. Semtech’s wide range of innovative analog and mixed-signal semiconductors and advanced algorithms provide just that. In this blog, we’ll feature a sampling of Semtech’s cutting-edge platforms that deliver the more intelligent, more robust and more compact designs empowering next-generation electronics. RClamp®: Semtech Transient Voltage Suppressors safeguard circuits against damage or latch-up caused by electrostatic discharge, lightning and other destructive voltage transients. With formats for a wide range of applications such as USB 2.0 and 3.0, HDMI, LCD 10/100 and Gigabit Ethernet, RS232 and more, Semtech’s RClamp line is suitable for nearly any high-speed application requiring low capacitance. LinkCharge® 20 Series: This new IC, a 20W mid-power (5W to 20W) wireless-charging transmitter chipset supports present and future fast charging protocols, and reduces system cost. The LinkCharge 20 series features flexible architecture which can be customized in order to wirelessly charge or continuously power devices through a physical layer, such as powering a surveillance camera through a window pane, or charging a phone through furniture. Additionally, LinkCharge 20 facilitates wireless charging of Internet-of-Things-connected objects, including LoRa®-based devices. Specific Absorption Rate (SAR) Sensors: Semtech’s Ultra-Low Power Smart Proximity Sensors for SAR enable accurate discrimination between an animate objection and human body, protecting consumers from electromagnetic radiation sources in electronic devices. Semtech offers the world’s first dual channel capacitive SAR controller, helping manufacturers easily meet stringent emission regulations criteria and SAR standards. Neo-Iso™: The Neo-Iso platform is an isolated intelligent power switch product family that is optimized to enhance smart home internet of things (IoT) applications and HVAC systems. The compact Neo-Iso switches make it possible for low-power microcontrollers to control high voltage loads in a system. Reporting of fault conditions from the switch to the controller enables system responses resulting in a safer, more efficient operation. ClearEdge® CDR: The ultra-low power, high-performing ClearEdge® CDR (clock data recovery) is engineered for next-generation data centers and enterprise network infrastructures. Semtech’s ClearEdge CDR platform has achieved widespread adoption for 100G applications and is now enabling next-generation 100G solutions focused on lower cost. LoRa Picocell Gateway: The LoRa long range wireless picocell gateway facilitates indoor IoT deployments for such applications smart homes, smart businesses and smart buildings. Semtech’s design is accelerating the adoption of IoT technology by bringing low cost LoRaWAN networks to market for consumers and private enterprises. This reference design offers a USB interface for low power gateway designs and connects thousands of sensors in a building or residential community within a range of one mile for outdoor sensor connectivity. Semtech offers a wide range of product platforms with variations to fit your unique design challenges. 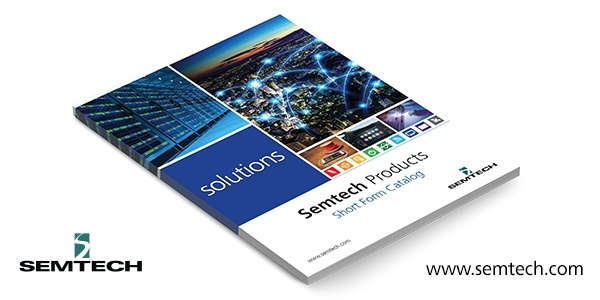 For a catalog of Semtech’s premier solutions, download our latest Short Form Product Catalog. View all Semtech collateral by market application within our Design Resources. Semtech, the Semtech logo, LoRa, RClamp, LinkCharge and ClearEdge are registered trademarks or service marks, and Neo-Iso is a trademark or service mark, of Semtech Corporation or its affiliates.